Goodbye daylight, and hello snow. It’s hard to believe that a year has already passed since the harsh winter of 2013-14, which finished with record snowfall and record cold temperatures for many areas, and 25 named winter storms from October to mid-April. Could this upcoming winter be as frigid and bitterly cold as the last? The 2015 edition of the “Farmer’s Almanac” predicts below-normal temperatures for about three-quarters of the nation, and a number of snowstorms involving heavy precipitation and strong winds lasting up until mid-March. According to the Almanac, during the end of January and entering February, we could see the coldest temperatures, with parts of the nation reaching 40 degrees below zero! So if these predictions are correct, the answer is yes, this upcoming winter will be as frigid and bitterly cold as the last, if not more so. 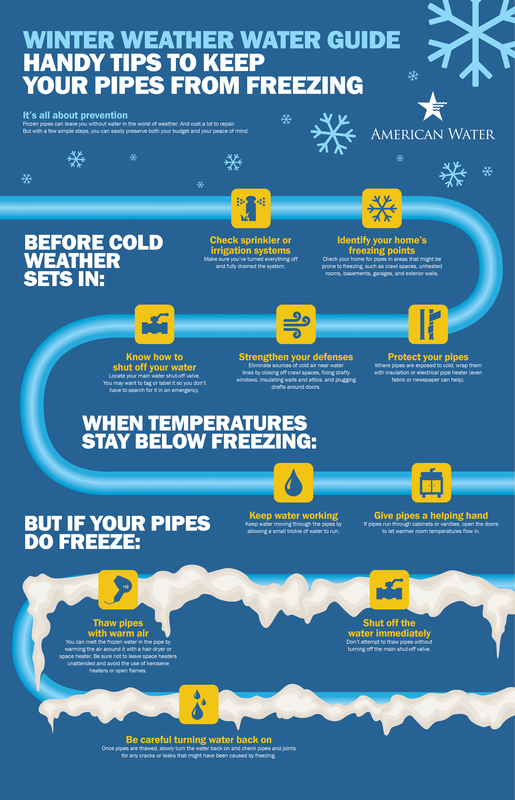 With dropping temperatures approaching fast, don’t be put at risk for frozen pipes in your home, and the costly plumbing repairs that come along with them. Look around your house for pipes that are not insulated and insulate them. This is especially important in unheated areas such as crawlspaces or attics. When I lived in Montana through cold winters, I found electric heating tape to be an effective and inexpensive way to keep pipes above 32 degrees. You could also use premolded foam-rubber sleeves or fiberglass insulation, available at most hardware stores. No matter what method you use, please be sure to read and follow the manufacturer’s directions to avoid a fire hazard. If you have already insulated pipes in the past, inspect insulation materials for cracks or fraying and making any necessary repairs. Seal cracks and holes in outside walls and foundations, particularly where cable TV or phone lines enter the house. A quick once-over with a caulking gun can help keep cold away from pipes. Drain any hoses and air conditioner pipes, and check for excess water pooled in equipment. If your home is heated by a hot-water radiator, bleed the valves by opening them slightly. Close them when water appears. Clean out gutters and downspouts to remove debris that can freeze and cause clogs during cold weather. Add extra insulation to the attic to prevent warm air from creeping into your roof, causing ice damage to the roof and gutters. Consider turning off outside hose bibs. If left exposed, these faucets and pipes can freeze. Set the thermostat at 55 degrees if you’re going out of town. Although a lower temperature might be fine, this setting is considered to be safe to prevent pipe from damage. If your pipes do happen to freeze or burst, shut your water off immediately. Know in advance where your water shutoff valve is. Mark it and share this information with other family members. Another important tip for winter and all year long is to make sure your water service provider and your other utility companies have the correct phone number to reach you in the event of an emergency. As more of us are opting to use a cell phone in lieu of having a home phone, it is essential that you register that number with your utility companies. If you haven’t already registered for an online account with American Water and your other utility providers, I encourage you to take a few minutes to do so. American Water customers can manage their account information online at My H2O Online. 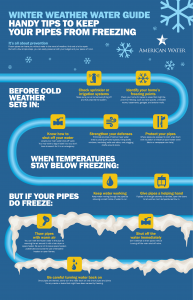 Protect your home and family by winterizing your pipes before it’s too late. Stay safe this winter, and of course, stay warm!